Managing your pool and spa can be a bit of challenge, this is where Crystal Falls can help you take control of your backyard experience with the most user-friendly, innovative pool automation and control systems on the market. Access pool and spa features via smartphones, desktops, and tablets through intuitive, convenient, and award-winning technologies. Anything you can control with a switch can now be controlled remotely by you or our team. Let us share the experience with you, Crystal Falls can access to your automation tools and we can work with you to make sure your systems are running at peak performance and set to your liking. With a full line of pumps, filters, heaters, lights, valves, water sanitizers, and the automation solutions to control it all, Crystal Falls Pools has the complete equipment package for any swimming pool or spa. Our systems fully integrate with home automation systems, and feature our patented seasonal adjust technology, which can modify schedules throughout the year, for substantial additional energy savings. Perfect for AirBnB’s, Rental Homes & Vacation Homes! While there are some things in life you can’t control, your swimming pool and spa should not be one of them. 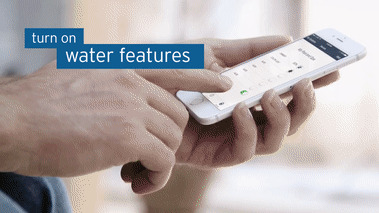 Imagine having the ability to change your pool or spa temperature while you’re shopping at the mall or turning on your waterfall and landscape lights while eating at a restaurant. All of this can easily be accomplished with the Jandy AquaLink RS System. With many advanced interfaces to control the system including hardware and an app for your own iPhone or Android smartphone, you can have total control of the backyard environment anytime, anywhere. We can install the iAquaLink web connect upgrade to your existing AquaLink control system so you have total control.